In this completely updated new edition, the best-selling author of 101 Great Answers to the Toughest Interview Questions and 101 Smart Questions to Ask on Your Interview takes you step-by-step through the hiring process. Whether you�re replacing an employee who�s leaving or creating a new position in your organization, Ron Fry shows you how to write a concise and accurate job description, identify key competencies, and how to translate them into a realistic set of search criteria. How to attract the best applicants. What to look for when you�re screening resumes, in your office or online. What questions you should ask in the interview...and when to ask them. How to listen more effectively to what the applicant is really telling you. How to probe for information the applicant doesn�t want to reveal. What questions the law permits and forbids. 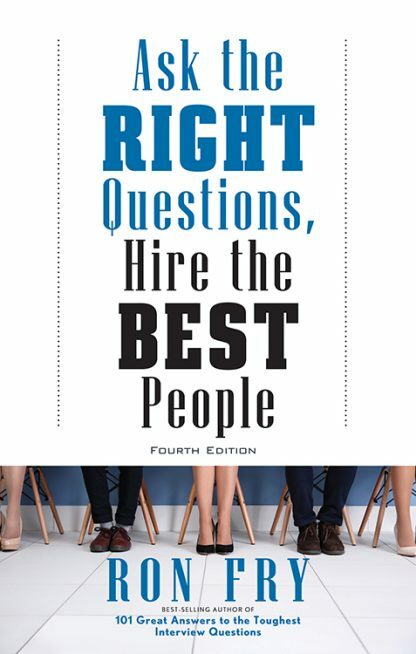 Whether you�re an interviewing novice or a seasoned pro, you�ll find all the answers you need in Ask the Right Questions, Hire the Best People, including new chapters on questions for managers and executives, identifying core competencies, and unearthing hidden objections. Ron Fry has written more than 40 books, including the best-selling 101 Great Answers to the Toughest Interview Questions and 101 Smart Questions to Ask on Your Interview. He is a frequent speaker and seminar leader on a variety of job-search and hiring topics, and the founder and president of Career Press. He lives in New Jersey with his family.